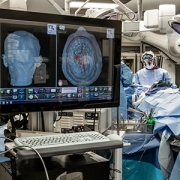 The virtual reality surgical system projects images into the operating room, allowing neurosurgeons to revisit the surgical plan in real time. 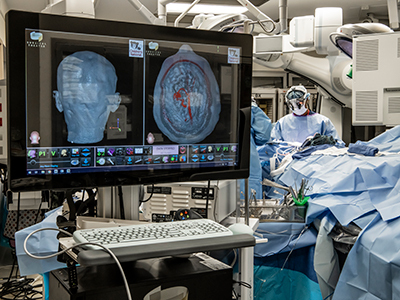 Neurosurgeons at Children’s National Health System are getting a new three-dimensional (3D) perspective on their cases thanks to an FDA-approved breakthrough virtual reality surgical system. 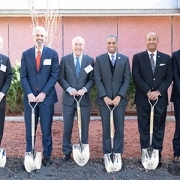 Children’s National is the first pediatric health system in metropolitan Washington, D.C., to use this state-of-the art system, created by Surgical Theater. It seamlessly integrates patient-specific surgical planning and navigation, professional education and rehearsal. The technology acquisition was made possible through a generous gift from Sidney & Phyllis Bresler, in honor of their children Alex, Jonathan and Amanda and grandson Theo Charles Bresler, and in loving memory of Joshua Stouck. The 3D, 360-degree view gives surgeons a cutting-edge digital tool to plan procedures in depth using an accurate capture of the patient’s unique anatomy, and also allows the surgeon to illustrate the surgical path in greater detail than ever before for patients and their families. On December 4, 2018, Children’s National Health System was named a 2018 “Top Children’s Hospital” by The Leapfrog Group, an independent watchdog organization. The highest performing hospitals on the Leapfrog Hospital Survey are recognized annually for this prestigious award. 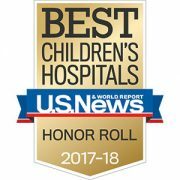 Children’s National is proud to have been recognized 10 times as “Top Children’s Hospital.” Top hospitals are given the designation for having distinct achievements in patient safety and quality, including lower infection rates, decreased length of stay, fewer readmissions and higher survival rates for high-risk procedures. 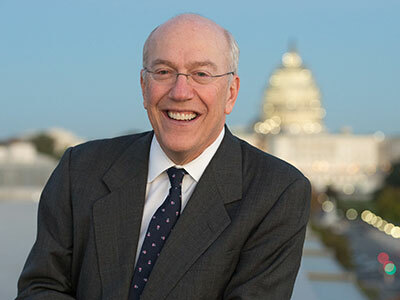 “Who speaks for children?” That’s a question Children’s National President and CEO Kurt Newman, M.D., often asks when he talks to groups around the country. As he sees it, children’s hospitals and their pediatric specialists should follow two main principles: Speak out to our nation’s policy leaders, local government officials and other business leaders about what’s right for the most vulnerable among us, namely our children; and listen to parents, helping them find their voices when it comes to health care decisions. 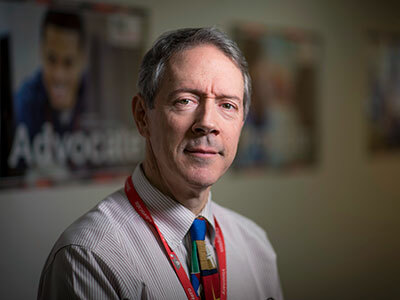 Pediatric specialists have a unique opportunity to serve as the voice for children and families who are so often lost in state and federal health care policy debates. 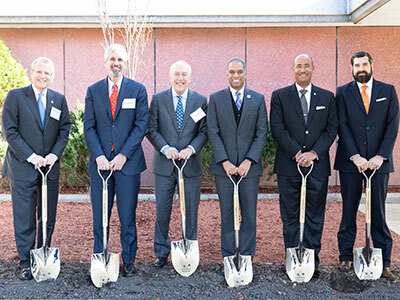 As the children’s hospital located in the nation’s capital, Children’s National has leveraged both its expertise and close proximity to key decision makers to engage in a dialogue about issues vital to the health and well-being of kids. In a perfect example of politics getting in the way of doing the right thing for children, it took almost four months for Congress to extend funding for the Children’s Health Insurance Plan (CHIP), which provides health coverage for nearly 9 million children of working families in the United States. CHIP often supports the patients with the most medically complex needs – and is pivotal to their care at Children’s National and hospitals around the country. 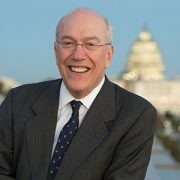 During the agonizing wait for the extension, Dr. Newman, as well as countless Children’s National pediatricians and government affairs leaders, spent hours encouraging, asking and telling policymakers at every level of government about the importance of investing more in children, not less. He stresses that it’s not just the right thing to do, it’s a wise investment. Spending dollars on children for prevention, early detection and education means that we have a healthier workforce, military and national community. It’s less expensive to treat mental and behavioral health problems, asthma and diabetes early on, before they become chronic issues. The steady drumbeat from Children’s National supported national advocacy urging Congress to protect health insurance for the millions of children who rely on CHIP for all their health care needs. The restored measure makes a world of difference for working families, but additional advocacy is needed as Congress continues to seek agreement on a long-term budget and other important legislation, some of which could have tremendous impacts on children’s health. Concurrent care for terminally ill children – where lifesaving treatments such as chemotherapy and physical rehabilitation can take place alongside comfort measures and palliative care like 24-hour nursing – is covered by most insurance programs, including CHIP and Medicaid. However, until recently, military families covered under Tricare with such desperately ill children were forced to choose coverage for one OR the other. Children’s National brought this challenge to its coalition partners at Tricare for Kids after watching several military families forced to make an agonizing decision between comfort and treatment. The coalition, a collection of military advocacy groups, children’s hospitals and other advocates, then fought hard to add a landmark provision to the National Defense Authorization Act allowing military families concurrent care coverage for their children. Implementing Tricare adjustments that deviate from Medicare provisions has been extremely difficult and politically fraught in the past, but when advocates and lawmakers focused on doing what’s right for kids, there was little to no Capitol Hill opposition and the change was easily passed in both the House and Senate. In addition to advocacy, every day, a children’s hospital should help parents find their voices as active, empowered and engaged team members when it comes to caring for a sick child. Children and their families are at the center of every decision made at Children’s National, from day-to-day care planning to large scale business initiatives. When focusing on doing what’s right for them, everyone – the children, their families, the community AND the healthcare organization – benefits. Children’s National is proud to be named #1 in Neonatology in the U.S. News & World Report 2017-18 Best Children’s Hospitals survey. Also, Children’s National was once again named to the coveted Honor Roll, placing them among the Top 10 children’s hospitals in the country. Being the #1 ranked Neonatology program reflects the quality of care throughout Children’s National because it requires the support and partnership of many other specialties, including cardiology, neurology and surgery. 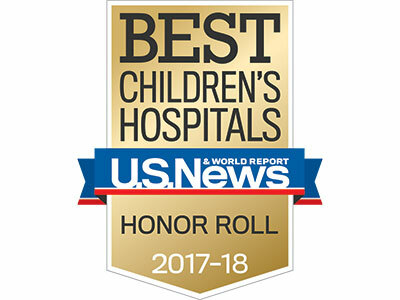 In addition to this honor, Children’s National ranked in the Top 10 in four additional services: Cancer (#7), Neurology and Neurosurgery (#9), Orthopedics (#9) and Nephrology (#10). For the seventh year in a row, Children’s National has ranked in all ten services, a testament to the pediatric care experts across the organization and their commitment to children and families. Children’s National is dedicated to improving the lives of children through innovative research, expert care and advocacy on behalf of children’s needs. In addition to being recognized among the “best of the best” by U.S. News & World Report, Children’s National is a Magnet® designated hospital for excellence in nursing and is a Leapfrog Group Top Hospital. As a top NIH-funded pediatric health system, Children’s National marries cutting-edge research with the highest quality care, to deliver the best possible outcomes for children today and in the future. 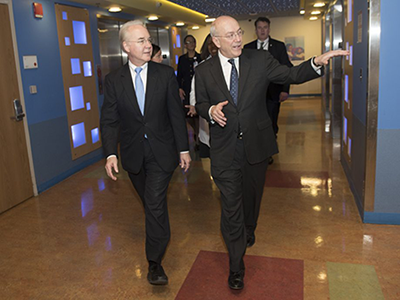 Children’s National President and CEO Dr. Kurt Newman welcomed Secretary of Health and Human Services Tom Price to the hospital for his first official visit as a member of the Cabinet. 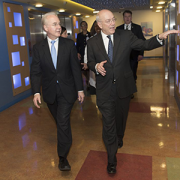 On February 14, Children’s National President and CEO Dr. Kurt Newman met with Secretary of Health and Human Services Tom Price at Children’s National. As part of his first official visit as a member of the Cabinet Dr. Price, who is an orthopaedic surgeon by training, toured our clinics and engaged in open dialogue with patients and families, clinicians, and members of the Children’s National leadership team. The visit highlighted the excellence of Children’s National care providers and the essential role pediatric hospitals play in helping kids grow up stronger. It was also an opportunity to ensure that children’s health needs are top of mind for a leader who will be central to shaping policies that affect millions of America’s kids. 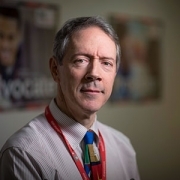 In their conversations, Dr. Newman emphasized the need for continued investment and dedicated health care infrastructure to support specialized care and research for children – an approach he outlined in detail this week in an op-ed in the Washington Post. Dr. Newman intends to continue engaging directly with policy leaders and speaking up for children during this pivotal period for the nation’s health care system. Learn more about advocacy efforts at Children’s National. 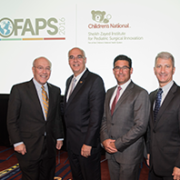 On Oct. 10, at the World Federation of Pediatric Surgeons (WOFAPS) Congress, in Washington, DC, the chief executives of four top North American pediatric hospitals held a candid discussion about bridging gaps in access to safe, high-quality surgical care for children everywhere. Below are three key strategies that emerged from the conversation. Kurt Newman, M.D., president and CEO of Children’s National Health System, kicked off Monday’s panel by describing a so-called innovation paradox. Game-changing innovations in pediatric medicine, he said, often emanate from both ends of the global development spectrum. First-world technologies–such as telemedicine and remote robotics–developed in affluent regions are bringing important specialized care opportunities to lower-resourced communities. At the same time, pressures experienced in developing regions to adapt to challenging conditions and resource constraints can lead to creative solutions with implications well beyond the third world. According to Michael Apkon, M.D., CEO of the Toronto-based Hospital for Sick Children, up to 85 percent of children in the developed world are cared for in emergency departments that have no specific in-house pediatric expertise. For the most part, he said, they are treated in general hospitals by physicians and nurses with no specific training in pediatric care. In remote areas like rural Ontario, there simply isn’t enough volume to sustain in-house pediatric specialists in every hospital, Apkon explained, “but there’s a big opportunity to provide support from centers that do have that capacity.” Through telemedicine and remote robotics, “we can guide caregivers that are quite capable of doing interventions if they have the right support,” he said. At the same time, technologies created to meet specific third-world needs are demonstrating potential for broader applications. Dr. Newman highlighted one such technology – a low-cost, disposable, multifunctional incubator for at-risk, low-birth-weight babies – developed by the Center for Advanced Sensor Technology at University of Maryland Baltimore County. The technology won a major grant earlier this week as part of a device competition at the 4th annual Sheikh Zayed Pediatric Surgical Innovation Symposium. Though it was developed specifically to help curb preventable deaths within the first week of birth in developing areas, the technology could have cost-reducing applications for hospitals around the world. Richard Azizkhan, MD, CEO of Children’s Hospital & Medical Center in Omaha, spent the early decades of his career working to reconstruct a functioning health care system in post-war Bosnia. A key starting point, he said, was building infrastructure for training and education. For several years during the war, there were simply no training opportunities for in-country physicians and nurses, he explained. Working with colleagues, Azizkhan set up educational exchange programs and academic centers to teach skills in minimally invasive surgery and other modern techniques. Over time, trainees become trainers, and those skills propagated widely. Success didn’t happen overnight. “It took literally 20 years to build that infrastructure,” he said. But today the country has capacity for very sophisticated care, including transplants and neonatal oncology. Dr. Apkon echoed the value of training opportunities for care providers in under-resourced regions. “Parts of the world that are blessed with the ability to have a specialized system have a moral obligation to help in whatever way they can to create capacity where it doesn’t yet exist,” he said. Through the SickKids-Ghana Initiative, 1500 nurses in Ghana are being trained to provide very basic services in rural communities that lack a developed healthcare system. The work is aimed at training nurses in foundational elements of holistic pediatric care, including administering treatments for low oxygen, dehydration, and low blood sugar. In his former capacity at the Cleveland Clinic, Marc Harrison, MD, incoming CEO of Intermountain Healthcare, was tasked with building an entire new multispecialty hospital in Abu Dhabi. When asked about the key to his success, Harrison didn’t hesitate. “The biggest thing we did right was have the right partner,” he said. Working with the Crown Prince of Abu Dhabi and many other local partners, Harrison gained insights about how health care is delivered in the region and any societal and political considerations that could impact the hospital’s operations. Dr. Azizkhan also emphasized the importance of partnerships – not just locally but globally. In North America, he pointed out, over 100 institutions are working together to share data and best practices to improve quality and safety across systems. Ventilator-associated pneumonias, central line infections, and surgical site infections, he said, can be dramatically reduced by sharing best practices.